Bombardier Case Study | Why Reinvent the KM Wheel? Bombardier | Why Reinvent the KM Wheel? As Bombardier began to deploy its knowledge management (KM) practice in 2012, APQC membership quickly became an invaluable resource for best practices, ideas, and methodologies. “APQC was mentioned by some colleagues and in university textbooks as a good source of information, so I initially subscribed for one year,” says Marco Beaulieu, head of knowledge management, Bombardier Academy. The subscription proved so valuable, Bombardier now has an ongoing APQC membership accessible by anyone in the company. The Bombardier aerospace segment’s engineering department is divided into 28 KM networks: communities of practice that bring together the most knowledgeable people in each domain to capture, transfer, and preserve knowledge. The networks initially grew organically through in-person interaction, but now – thanks to the work of the KM team – they have a SharePoint portal where they can collaborate online and access a growing knowledge base. Knowledge Management Advisor Nathalie de Preux and her four-member Knowledge Management Practice team support KM for the Product Development Engineering team, helping to capture and disseminate the knowledge that has made the company a global leader in aircraft manufacturing. 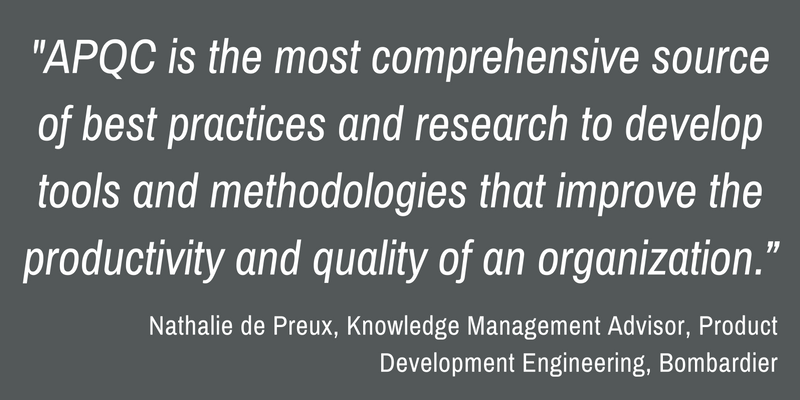 While developing the SharePoint resource and other KM initiatives, de Preux has frequently mined the APQC Knowledge Base for best practices, benchmarking findings, and case studies to inform her team’s work. Instant access to proven best practices and tools has saved valuable time, she notes. Because APQC data is backed by solid benchmarking and research, de Preux trusts its quality and accuracy more than other sources she might encounter with a web search. In addition to the SharePoint project, the KM team has applied information gleaned from APQC resources in many other areas. For example, while researching metrics to measure the value of KM, de Preux found APQC articles about developing KM metrics models. These convinced her and her team of the need to establish a baseline for the KM practice before developing key performance indicators (KPIs). This prompted the team to evaluate their existing KM measurement system, establishing a baseline against which to gauge improvement. Additionally, the KM team has adapted APQC’s Levels of Knowledge Management MaturitySM model to measure the progress of the company’s knowledge networks. The KM team has also used APQC’s Knowledge Management Framework as a starting point for its own custom framework, saving time developing an optimal KM strategy while accessing pre-populated links to content, best practices, tools, and templates in APQC’s Knowledge Base. APQC KM resources have helped the KM team create the culture change needed to ensure the knowledge transfer is sustainable. Some of the resources Beaulieu and de Preux have found particularly valuable include APQC’s KM Framework, Improving the Flow of Knowledge in Product Development, and Connecting People to Content, to name just a few. “I also like the benchmarking articles where we see how other industries apply KM concepts and initiatives,” de Preux notes. Beaulieu, De Preux and the KM team soak up additional knowledge through APQC webinars, which they watch as a team about once a month over lunch. As “KM evangelists,” Beaulieu and de Preux value the ability to tap directly into the KM knowledge and experiences from within a wide variety of organizations as well as from APQC’s own KM experts and advisors. Beaulieu encourages others within the organization to access Bombardier’s APQC membership by sharing relevant material as he encounters it and promoting APQC resources within the organization’s quarterly newsletter. APQC helps organizations work smarter, faster, and with greater confidence. It is the world’s foremost authority in benchmarking, best practices, process and performance improvement, and knowledge management. APQC’s unique structure as a member-based nonprofit makes it a differentiator in the marketplace. APQC partners with more than 500 member organizations worldwide in all industries. With more than 40 years of experience, APQC remains the world’s leader in transforming organizations. Visit us at www.apqc.org, and learn how you can make best practices your practices. Learn more about APQC Membership!